Vikram, a cop who is mourning the death of his wife, is assigned to retrieve a missile. He is aided by a highly educated engineer Preethi, who holds the knowledge to disarm the nuke, in his mission. © 2018 Scratchu.com Vikram | Santhana Bharathi, Chinnijayanth, Charu Haasan, Kamal Haasan, Janagaraj, Dimple Kapadia, Amjad Khan, Lizy, Aachi Manorama, Prathapachandran, Sathyaraj, R.S. 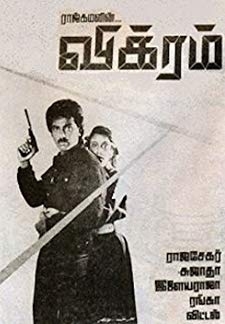 Shivaji, Vani - Vikram (1986) | Tamil Movie | 7.3/10 | Synopsis : Vikram, a cop who is mourning the death of his wife, is assigned to retrieve a missile. He is aided by a highly educated engineer Preethi, who holds the knowledge to disarm the nuke, in his mission.... Watch Online!! !